Defeat the Capitalist Onslaught Against Public Education (June 2001). 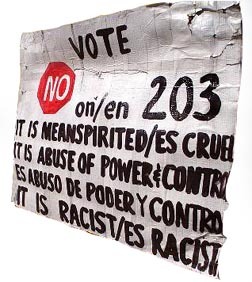 Smash Racist Purge of CUNY (February 1999). Equal Language Rights for All! have forced students into English “immersion” program was defeated. The nationwide campaign against bilingual education is escalating. This past November, two states had a reactionary referendum on the ballot outlawing programs with classroom instruction in non-English languages. In Colorado, Amendment 31 was defeated, but in Massachusetts Question 2 was passed, by a record 70 percent. The hotly debated Massachusetts initiative called for replacing the state’s bilingual program with a one-year English “immersion” program. Ominously, the ballot measures called to sue teachers, even jail them, for using any language other than English in the classroom. Not only bilingual teachers but English as a Second Language (ESL) instructors are targeted, and the immigrant-bashers are also going after teachers unions. The racist attack on bilingual ed goes together with the detentions of thousands of immigrants following the 11 September 2001 World Trade Center attack, and underscores the urgent need for the workers movement to mobilize in defense of immigrants’ rights. This new offensive has nothing to do with theories on how best to educate children and everything to do with a national chauvinist onslaught against “foreigners.” The referendum was financed in large part by Silicon Valley millionaire Ron Unz, the xenophobic software magnate who bankrolled the “English Only” drive against bilingual education in California (Proposition 227) and in Arizona (Proposition 203). Unz feeds on racist stereotypes and whips up nativist hysteria with articles such as his piece “California and the End of White America” in Commentary (November 1999). At the height of the post-9/11 anti-terrorist frenzy, Unz wrote an Internet article for the far-right National Review (26 October 2001) denouncing theorists of bilingual education as “tiny groups of educational terrorists in our midst.” Earlier, Unz referred to bilingual teachers as “human vampires.” Now he is pushing for national legislation banning bilingual education and taking aim at New York. Behind the battle over bilingual education is the dramatic rise in immigration to the U.S. over the last two decades. In the 2000 census, 11.2 percent of the total U.S. population was foreign-born, some 30 million people, up sharply from 4.7 percent two decades earlier. If you include children of immigrants born in the U.S. and the considerable number of undocumented workers, the actual figures are far higher. This is possibly the highest level of immigration in modern U.S. history, and certainly the highest since the 1920s. Today there are several new elements. For one thing, there are sizeable areas of homogeneous non-English-speaking populations. In southern California, the Southwest and most metropolitan areas, there are huge tracts where Spanish is the predominant language. Also, immigrants are now present in “heartland” areas of the Midwest and Deep South. From North Carolina to Nebraska, workers in many meatpacking and poultry plants are now predominantly Latino and Asian. Indeed, whole sectors of the U.S. economy depend on low-wage immigrant workers, and this is unlikely to change in the near future. As in the ’20s, the growth of immigration has been accompanied by anti-immigrant hysteria, from Ku Klux Klan attacks and vigilante “border patrols” to a raft of state and national legislation against immigrant rights. The xenophobes are terrified that the United States is becoming a multilingual country. The idea that English will no longer be the dominant language in the U.S. is a paranoid fantasy driven by racist fears. Thousands of immigrants are turned away from English classes because every slot is filled. In fact, English is the overwhelmingly predominant language internationally in commerce and every other field, reflecting the dominance of U.S. imperialism. Moreover, the U.S. capitalist economy owes much of its relative strength to this large-scale immigration, in contrast to its imperialist rivals of Europe and Japan, where the population is either stagnant or falling. But it is certainly true that with millions of new foreign-born residents, the United States is becoming more ethnically and linguistically diverse. This is a good thing. What the nativist racists fear, proletarian internationalists greet. The Internationalist Group demands: Full citizenship rights for all immigrants! No discrimination against any language! Defend bilingual education against racist assault! For worker-immigrant defense against racist attacks! While the anti-bilingual education referendum passed at the polls in Massachusetts, that has not ended resistance to this anti-immigrant drive. Question 2 was opposed by groups including faculty, graduate employees and campus workers unions at University of Massachusetts, teachers unions in Boston and elsewhere in the state, and activists from the Asian and Latino communities. While the ballot question passed by a majority of nearly three-to-one in the state, a poll of Latino voters showed them virtually unanimous (92 percent) in opposition, while the Asian vote in Boston was 67 percent against Question 2. The measure failed in Boston, Cambridge, Somerville, Brookline and Newton, as well as 15 communities in western Massachusetts. 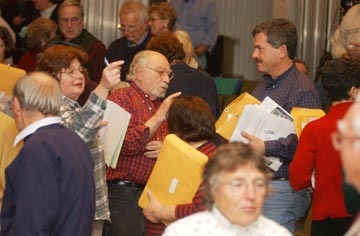 In the college town of Amherst, people were up in arms over the issue and a jam-packed town meeting on December 9 voted to seek an exemption to the state law. The implementation of some of the specific measures is now an open question. The law is not scheduled to go into effect until school starts next September. Republican governor Mitt Romney pretended during his election campaign that he would kill the “sue teachers” provisions, but now says “he opposes any effort to gut the new law” (Standard-Times [New Bedford], 18 December 2002). “Dozens of bills have been filed on Beacon Hill, seeking to curb or roll back the initiative,” the paper reports. Some school systems are seeking waivers and a few school administrators have said that they would defy the law. One educator remarked, “a few well-organized single-school sit-ins would alter the atmosphere considerably.” That would help, but what’s really needed is for teachers and students to take mass defiant action, and for labor to mobilize its power to defend its many immigrant members against this racist attack. Out of the schools and into the streets, and let the state try to jail hundreds of teachers, students and trade-unionists! The backers of the drive against bilingual education are all-purpose reactionaries. One of the most prominent is Boston University chancellor John Silber, a notorious right-wing attack dog. His particular target is teachers unions: “The teachers union is working hard to perpetuate these jobs” and is “trapping” children in a “linguistic ghetto” (Boston Herald, 14 March 2002). As president of BU in the 1980s, Silber broke a bitter faculty strike and turned the university into a conduit for Reaganite Cold War schemes. In 1984 he was named to the Kissinger Commission on Central America, which called for funneling millions to the Nicaraguan contra terrorists. In 1986, he got hundreds of thousands of dollars from the U.S. Information Agency to train anti-Soviet Afghan mujahedin (holy warriors) as “journalists.” In a McCarthyite red-baiting campaign, a former Communications College dean who objected to the Afghan Media Project was accused of ties with the Communist Party and even linked to Alger Hiss. Perhaps Silber will inform us of how many of his Afghan protégés in this CIA-style disinformation scheme ended up with another former CIA “asset,” Osama bin Laden. To pump up their “academic” credentials, the “English only” crowd trot out pseudo-scientific research designed to serve right-wing reaction. The phrase “scientifically-based research models” is the new catchword used to bully educators into everything from high-stakes testing to phony phonics reading schemes. In Massachusetts, their favorite is Dr. Christine Rossell, who was named head of the BU political science department under Silber and later advised him on educational affairs when he was head of the Mass. state board of education. In a chapter in a book edited by Diane Ravitch and Joseph Viteritti, Lessons From New York City Schools (Johns Hopkins University Press, 2000), Rossell writes: “Language-minority children should be taught in English…. Scientific research indicates that language minority children generally have higher achievement if they are taught in English rather than in their native tongue.” Scientific studies show nothing of the sort, and this Silberite political scientist who fancies herself an education “expert” is hardly unbiased. 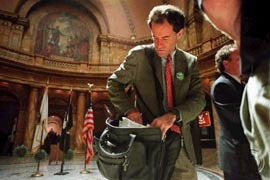 Rossell was co-chair of Unz’s 2002 Massachusetts Initiative Campaign. Rossell’s dubious “scholarship” has been exposed by leading figures in the field of ESL and bilingual education. Stephen Krashen, perhaps the leading authority in the U.S. on second language acquisition and architect of California’s bilingual education program, has devastated Rossell’s claim that immersion is better than bilingual education, as supposedly shown in “72 nationwide studies.” In a note to Eric Huber of the Denver Post (19 June 2002) on Huber’s article about the Colorado anti-bilingual ballot proposal, which quoted Rossell as a supposedly objective scientific expert, Krashen noted that “nearly every other researcher who has looked at the data has concluded that bilingual education has been successful.” “Only two studies in her lists were done in the U.S.,” he pointed out. Of those, the first only “showed that well organized bilingual education is better than bad bilingual education,” and the second involved only 16 children in the bilingual program and lacked any evidence, even test scores. Most of Rossell’s research consisted of comparisons of different versions of Canadian immersion programs, “really different versions of bilingual education,” designed for elite middle-class students. In fact, the right-wing attack on bilingual education is part of a broader attack on public education as a whole. The book by Rossell and Keith Baker, Bilingual Education in Massachusetts: The Emperor Has No Clothes (1996), has frequently been cited as the “scientific” authority for axing bilingual ed. Yet this book is published by the right-wing Pioneer Institute which is spearheading efforts at privatizing education through vouchers and gutting virtually every other government service, from closing mental hospitals to raising MBTA mass transit fares. Pioneer is pushing Edison Schools, designed by former Yale University president (and union-buster) Benno Schmidt, and other for-profit corporations to take over public schools. It is modeled on the Manhattan Institute in New York, which played a leading role in eliminating the remnants of open admissions at the City University by eliminating English-language “remediation programs” (see “Right Wing Yale Cabal Targets CUNY,” in The Internationalist No. 7, April-May 1999). But while Edison just took over scores of Philadelphia schools, its test score results have been a miserable failure and its stock has gone through the floor. It’s revealing that the anti-bilingual education “experts” at this right-wing think tank are also opposed to “forced busing.” Rossell and her associates recently published a treatise, School Desegregation in the 21st Century (Pioneer Institute, 2002), arguing, according to the publisher, that desegregation has had “serious costs – white flight and protest voting –associated with ‘forced busing’ and the use of strict racial quotas.” An earlier book by Rossell, The Carrot or the Stick for School Desegregation Policy: Magnet Schools or Forced Busing (Temple University Press, 1990), argued that “voluntary” integration plans with the incentives of good schools were “more effective.” That programs involving small numbers of students placed in brand-new, well-equipped and staffed schools, or like Boston’s METCO plan which bused students from Roxbury and Dorchester to schools in affluent suburbs like Newton, Lexington, Lincoln and Wellesley, produced higher grades than busing to rundown schools in hostile South Boston – what is that supposed to prove? Counterposing magnet schools to court-ordered busing is artificial. If city schools were integrated and funded at the levels of those in the upscale white suburbs, there would be dramatic improvements in scholastic achievement across the board. Coming out of Boston, which was the scene of the key battle for integrating northern schools, the Rossell/Pioneer tracts are the academic voice of the racist lynch mobs in Southie that attacked black school children while screaming against “forced busing.” These pseudo-scientific studies are nothing but “respectable” apologies for the resegregation of U.S. schools. In Rossell’s case, it turns out that in addition to her day job at BU, she “also works as a paid consultant to help school districts end busing” (Standard Times, 30 June 1996). And now they are playing the same role for the “English only” anti-immigrant racists. What was needed in the 1974 Boston busing crisis, as revolutionary Marxists demanded at the time, was to implement the busing plan, extend busing to the suburbs, eliminate the built-in discrimination of funding schools by local property taxes, and provide integrated, free, quality public education for all. In the face of the marauding anti-busing mobs that rampaged through Southie, while liberals and reformists looked to federal troops, the Trotskyists called for labor/black defense of busing to crush racist attacks. And rather than looking to the liberal Democratic Boston Brahmins, as the rad-libs did, it was necessary to build a workers party fighting for a workers government. Defeat the Immigrant-Bashers with Sharp Class Struggle! That is not to say that bilingual education doesn’t have plenty of problems, just as the rest of the big urban education systems in racist, capitalist America: mired in mediocrity, hamstrung by bureaucracy, hobbled by lack of books, sometimes staffed with poorly trained teachers and financially strapped in every way. Bilingual ed also has its fair share of hare-brained “reform” schemes and fads. Some of the scandals publicized by Unz in California were actually the result of administrative scrambling to get around the huge across-the-board cutbacks mandated by the earlier Proposition 13, which slashed local school boards’ budgets (e.g., Chinese kids put into bilingual Spanish-language classes because these programs still existed since they were protected by a legislative mandate). Also, in Colorado the fight against Amendment 31 last fall grotesquely relied on TV ads appealing to the same anti-immigrant racism as the anti-bilingual forces, saying that if the measure passed it would cause “chaos in the classroom” as Latino students would pour into class with “our children.” As opposed to this garbage, the fight against attacks on bilingual ed must be part of an overall fight for language equality and integrated quality public education. English “immersion” is a sink or swim program, and the obvious and predictable result is that large numbers of immigrant children will sink. The same goes for the introduction of mandatory high-stakes testing for high school diplomas, and even to get into high school (9th grade). Statistics? Try these: in New York City, where 36 percent of the population is foreign-born, where over half the students are immigrants or the children of immigrants, and where mandatory English-language tests have been imposed to get into ninth grade or to graduate, fully 31 percent of English language learners who should have graduated in June 2001 instead dropped out of school. Or more accurately, they were forced out. As an article in the New York Times (24 June 2002) reporting this figure headlined: “Critics Say Regents English Tests Push Immigrants to Drop Out.” Nationwide, a 2001 conference organized by the Civil Rights Project of Harvard University reported that in 200 to 300 of the biggest schools in the country’s 35 largest cities, less than half of those who enter ninth grade graduate. Unz and his academic hacks portray bilingual education as if it’s some kind of sinecure pushed by teachers unions and Latino nationalists. Bilingual ed is an exclusively Hispanic program, they claim. This is true in some places, and emphatically not in others. In New York City there are bilingual programs in Spanish, Chinese, Haitian Creole, Russian, Korean, Bengali, Polish, Arabic, French, Urdu and Punjabi. But the fact is that the force out rate for Latino immigrants is staggering, 44 percent don’t graduate in NYC, according to a statistical summary by Dr. Ofelia García of Columbia Teachers College (“The Languages and Literacies of Latin American Children in New York: Implications for Schooling,” November 2002). Throwing children who do not speak, read or write English, who live in impoverished inner city ghettos and barrios, often in precarious family situations, into classes conducted exclusively in English where they can’t even understand the words of what is being taught – which is what “English immersion” amounts to – is a recipe for purging the schools. And it is not an accidental purge. “The masters of American capitalism are intent on creating a far more sharply polarized economy, in which there will be a relatively highly paid technologically proficient petty-bourgeois layer and a mass of low-paid service workers, while industrial wages will continue to be slashed in a ‘race to the bottom’ in the name of competitiveness…. And along with this shift, a more sharply bifurcated, public-private educational system is being created…. “A second element of the current ‘reform’ plans is forced ‘Americanization’ of immigrant students. U.S. capitalism has attracted millions of immigrants, both legal and ‘illegal,’ from Latin America, Asia and Africa to provide low-wage labor….While the bosses are eager to gouge workers by paying minimum and sub-minimum wages, they are worried about their ability to control millions of oppressed and exploited immigrants. Hence the ‘crisis’ over bilingual education. Numerous studies confirm that students for whom English is not their native language stay in school longer, score higher on English and other subject matter tests and have higher graduation rates if they have had some degree of instruction in their native language. The purpose of eliminating bilingual education is not to improve the education of the students, it is to regiment them. Ultimately, it is to regiment them for war. During the 1991 Persian Gulf War military recruiters scoured immigrant neighborhoods looking for recruits, promising citizenship as a carrot. Today, the same 2002 “No Child Left Behind” educational “reform” act that eliminated federal funding for bilingual education also serves as a back door to reinstating selective conscription, requiring high schools to supply names and addresses of juniors and seniors to the Pentagon. Military recruiters then put the arm on minority and working-class youth to join up, promising educational opportunities while saying little about becoming cannon fodder for the imperialist war machine. The Marine drill sergeants want the “grunts” to snap to when they bark orders at them in English, and they don’t want their recruits talking to each other in Spanish, Chinese or any other “foreign” language. Just like employers who ban Navajo Indians from speaking Navajo and Mexican workers from speaking Spanish. Forced Americanization is the program of the ruling class. That is why the xenophobic far-right opponents of bilingual education have the wind in their sails. The workers movement, in contrast, must champion the cause of immigrants. An increasing portion of the working class in the United States is foreign-born, including some of the most militant fighters in recent unionization drives. The Boston building service workers who recently won recognition for their SEIU union as part of the “Justice for Janitors” campaign are an example. The SEIU along with Massachusetts teachers unions opposed the Question 2 referendum against bilingual education. But lobbying the Democrats and sending postcards is a dead-end. This is typical of the mentality of pro-capitalist union bureaucrats, who focused on a failed effort to elect a Democratic Party governor, tying the workers to the bosses’ parties. Yet a radicalized workers movement, with a class-struggle leadership, would become the greatest champion of immigrants and of oppressed black, Latino and Asian minorities. Whenever the workers movement has seriously fought the bosses, its struggles have been marked by the fighting unity of U.S.-born and foreign-born workers. Class-conscious unionists and fighters for immigrant rights in Massachusetts can look back to the example of the 1912 Lawrence textile workers’ strike, led by the syndicalist International Workers of the World (IWW). The employers had brought in Arab, Russian and East European women to toil in the Lawrence mills, and tried to keep them separated by playing on ethnic and language divisions. Women workers were in the forefront of the strike, led by the 21-year-old IWW organizer Elizabeth Gurley Flynn, and strike meetings were translated into 25 languages. In the 1919 steel strike, the bosses attacked the workers as “foreigners” and “Bolsheviks,” while the workers put out leaflets in six languages calling to strike against “Czar Gary,” the head of U.S. Steel, and to defend Soviet Russia.